When you register with the BBC, we ask for permission to contact you with details of BBC content and services that are available in your region. You’ll receive regular newsletters about the latest programmes, services and experiences from across the BBC. 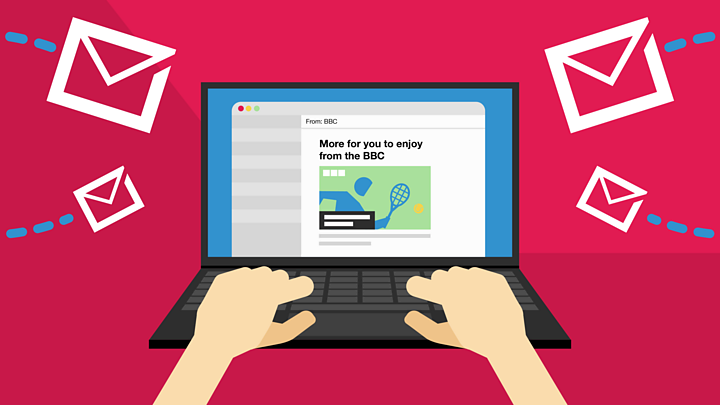 And sometimes we might personalise your newsletter based on how you’ve used BBC websites and apps while signed in. To do that we'll use information like your location, what you’ve viewed on BBC Online and things you’ve told us you like when you’ve been signed in. You can find out more about personalisation here. Like the sound of it? You can also subscribe to these newsletters here. Remember, if you’re under 16 you’ll need permission from a parent or guardian. If you’ve separately given permission to our commercial arm, BBC Worldwide (for example, when using the Top Gear or Good Food websites), we may also contact you about BBC commercial products and services. There are also newsletters about certain specific BBC programmes and channels. Visit the relevant channel and programme pages to find out how to subscribe. Don’t want to receive a newsletter any more? You can unsubscribe. Just click the “Unsubscribe” link at the bottom of any BBC newsletter. Like emails to reset your password or verify your email address. We’ll only send emails like these when they’re vital. Any data we have about you is anonymous. When we use other organisations to send newsletters for us, your email address will always be encrypted and will never be shared for commercial gain.